Like many farm and ranch families in Southwest Nebraska, Bryan and Ami Hauxwell have had a life-long interest in 4-H and FFA. Ami, whose maiden name was Ruf, was involved in 4-H projects in Furnas County, while Bryan was active in 4-H in Red Willow County. As a result, it was only natural that 4-H and FFA would remain an important part of Bryan and Ami' s life after they married and started a family. Now, with two children in their teens, 4-H and FFA projects keep the Hauxwells hopping, as the family participates in both cattle and horse projects on the county, district and state levels. Brendon, who will turn 17 this month, has market steers, stocker-feeders and a cow-calf herd, while Kathlyn, 13, participates in horse projects as well as showing a market steer and market heifer. Giving them help in preparation for his days as a 4-H'er is their younger brother, Braceton, 5. Tom Tirrill, manager of Stockman's Feed & Supply, Inc. added the Weaver Product lline two years ago due to its popularity with 4-H and FFA members. Because of all the time, travel and work involved, the 4-H and FFA shows require a united family effort. "It also takes a good business partner," Ami said, expressing her appreciation to Stockman's Feed and Supply for the great support they have given the Hauxwell family through the years. "Bryan started with Stockman's when he was a 4-H member, and we have been doing business with Stockman's throughout our married life. We couldn't be happier. The Purina show chow feeds have done a great job for us. We also like the Weaver Products, which give a shine and sheen to the cattle and horses at shows." 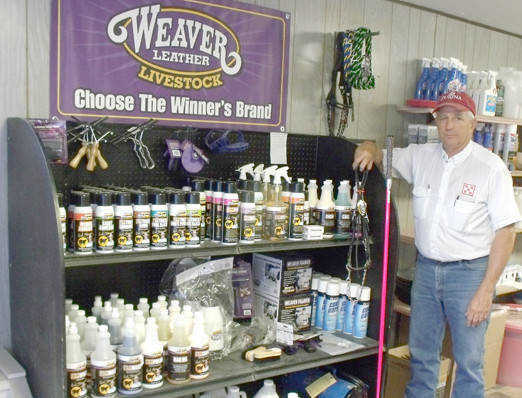 The Weaver Products, added two years ago by Stockman's due to popular demand, not only include conditioners for the animals, but also fans, show boxes, show sticks, halters and clippers. "The Weaver Products have gone over really well," Tirrill said. "Customers like the fact we have them in stock and that items they need are readily available." This is an especially busy time for the Hauxwells, who have a cow-calf backgrounding operation and a cattle trucking business. Add to that the shows in McCook, Grand Island, Lincoln and other locations and the Hauxwells are constantly on the move. In the show season which started last November, Brendon's pride has been "Deacon," a Chianina-Maine which now weighs 1,325 pounds, and "Fire," a purebred Simmental, which at 1,300 pounds, is close to its finish weight. Brendon also shows stock-feeders as an FFA project. Both Brendon and Kathlyn are members of the Little Rascals 4-H Club and Kathlyn is also involved in Project Pals and the Bit 'n Spurs Horse Club. The horse projects are new for Kathlyn, who is taking part in western pleasure, western horsemanship, showmanship and halter with her 7-year-old Palomino, "Demi." Even though this is Kathlyn's first horse, she is doing quite well, including qualifying for the state horse show. In addition to her horsemanship activities, Kathlyn is continuing with cattle projects. Her market steer is a Maine-Anjou cross,"Beckett," who weighs in at 1,250 pounds. Her market heifer is a crossbred, "Rhinestone," who weighs 1,200 pounds. All of Brendon and Kathlyn's 4-H animals benefit from Purina feeds from Stockman's Feed & Supply. Principal feeds for the cattle are Fitter's Edge, Finishing Touch and Full Control, while Strategy is the preferred feed for "Demi," the Palomino. Stockman's serves customers from a wide area in Southwest Nebraska and Northwest Kansas through their stores in McCook and Benkelman. "Fair season is not only a busy time for us," Tirrill said, "but it is also a proud time because of all the fine projects shown by the 4-H and FFA youth who use Purina and Weaver products." "We are honored to serve the Hauxwells and the other 4-H and FFA members and their families and wish them great success during fair season," Tirrill said.